Second in a three part series. 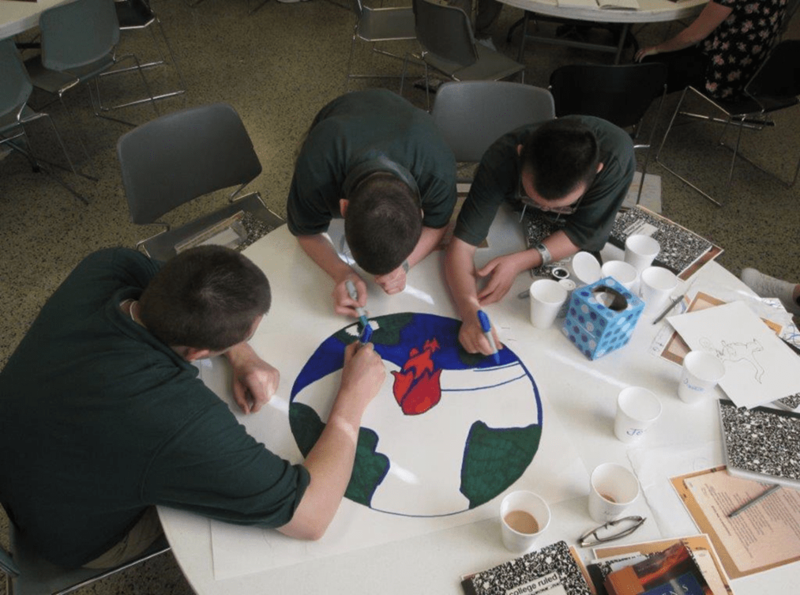 After years of working with adult men, answering the call of Matthew’s Gospel to visit the imprisoned, a federal prison chaplain in Miami requested that Kairos Prison Ministry International, Inc. create a model to give younger inmates a “positive family experience.” The hope was early intervention would change the course of their lives and break the cycle of crime. Kairos Torch was born in 1997 and launched in a youth facility in Oklahoma to minister to adults 25 and under. There are currently two similar programs in Central Florida, one in Daytona Beach and the other in Orlando. The incarcerated are introduced to Christ’s unconditional love and forgiveness during a weekend retreat. The retreat is followed by six months of mentoring. As youth are still maturing, this “is the most important element” in the process says Our Lady of Lourdes parishioner Brian Seeber, who heads the program for the Daytona Beach Juvenile Residential Facility. The goal is to encourage offenders to see their God-given potential. It is an effort that takes time, God’s time, the definition of kairos. Gay Taft, a member of Episcopal Church of the Resurrection in Longwood, has worked with Kairos since 2001 and Kairos Torch since 2010. She notes one of the main differences with Kairos Torch is men and women serve as guides after the retreat to strengthen the family environment. “Many of the mentees have never met their own fathers and are already parents themselves,” she said. Modeling a familial setting helps them envision the ideal for themselves and mentoring gives them the tools to carry it out. One of those tools is an exercise known as ‘father forgiveness.’ Through prayer and reflection, participants are invited to forgive their fathers’ failures. They also learn to forgive themselves. Taft states, “What makes us different is that we come back.” The trust developed in the mentoring process builds bonds of love and mimics God’s love for us. As government leaders look for ways to avoid the incarceration of youth due to the long-term detrimental effects on their futures, facilities with Kairos Torch in Brevard and Polk Counties have closed. Kevin Resnover, Kairos Torch youth ministry coordinator, explained, “Those of us in the free world make 220 or more decisions a day. Those who are incarcerated make about 22 or less.” This has a profound impact for youth who are in prime developmental stages of maturity. There is currently a program in the works to help troubled youth outside of a prison setting. For more information about Kairos Torch volunteer opportunities in Daytona Beach, contact Brian Seeber at brianseeber@earthlink.net. In Orlando, contact Virginia Lopez at vlopez@standrew-orlando.org.